Low Carb Diet Low Carb Meals and Low Carb Snacks that Satisfy the Whole Family Now, a complete, sensible way to introduce the entire family to healthier eating with a low carb diet plan. 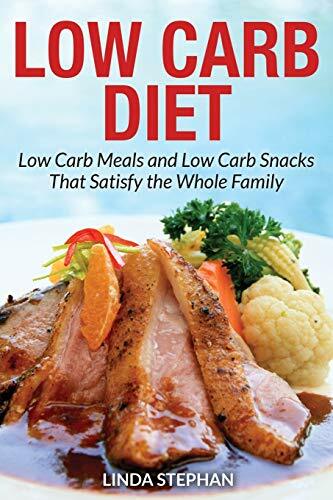 Included are a list of low carb foods, an explanation of the benefits gained by using a low carb diet, and delicious recipes to make and include in any low carb diet menu. There are 50 delicious low carb recipes that have under 500 calories per serving. Extra tips, such as a low carb diet food list, will help you know what foods to keep on hand. Make ahead treats, that are simple and convenient, will soon replace fatty chips and high-carb sweets. Other great ideas, such as meals that satisfy, and foods that deliver more than low calories, are shown in easy to understand recipes. Learn how to store and prep for your meals and snacks so there will always be plenty on hand. New breakfast, lunch and dinner ideas, are just a few of what makes up these creative recipes.